Hajipour, V., Fattahi, P., Nobari, A. (2014). A hybrid ant colony optimization algorithm to optimize capacitated lot-sizing problem. Journal of Industrial and Systems Engineering, 7(1), 1-20. Vahid Hajipour; Parviz Fattahi; Arash Nobari. "A hybrid ant colony optimization algorithm to optimize capacitated lot-sizing problem". 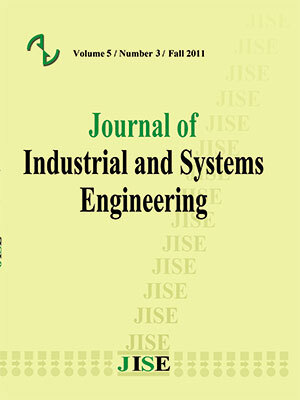 Journal of Industrial and Systems Engineering, 7, 1, 2014, 1-20. Hajipour, V., Fattahi, P., Nobari, A. (2014). 'A hybrid ant colony optimization algorithm to optimize capacitated lot-sizing problem', Journal of Industrial and Systems Engineering, 7(1), pp. 1-20. Hajipour, V., Fattahi, P., Nobari, A. A hybrid ant colony optimization algorithm to optimize capacitated lot-sizing problem. Journal of Industrial and Systems Engineering, 2014; 7(1): 1-20. The economical determination of lot size with capacity constraints is a frequently complex, problem in the real world. In this paper, a multi-level problem of lotsizing with capacity constraints in a finite planning horizon is investigated. A combination of ant colony algorithm and a heuristic method called shifting technique is proposed for solving the problem. The parameters, including the costs, demands and capacity of resources vary during the time. The goal is to determine the economical lot size value of each product in each period, so that besides fulfilling all the needs of customers, the total cost of the system is minimized. To evaluate the performance of the proposed algorithm, an example is used and the results are compared other algorithms such as: Tabu search (TS), simulated annealing (SA), and genetic algorithm (GA). The results are also compared with the exact solution obtained from the Lagrangian relaxation method. The computational results indicate that the efficiency of the proposed method in comparison to other meta-heuristics. lot-sizing problem with lost sales; Computers & Operations Research 40; 264-272.
problem in multi-stage assembly systems; Management Science 30; 222-239.
structures; Operations Research 34; 237-249.
problems; Operations Research, 41; 549-571.
immediate lost sales; European Journal of Operational Research 147(3); 558-566.
problems; European Journal of Operational Research 200; 599-606.
capacitated lot-sizing; Management Science 30; 1255-1261.
problems; Management Science 46 (5); 724-738.
with a bottleneck; Management Science 32; 989-1006. Journal of Operational Research 168; 1-16.
economic objectives; International Journal of Production Economics 91(1); 47-62.
inventory lot size models with a linear demand function; Computers & Operations Research 5(2); 157-160.
schedules; IEEE Transactions 29; 109–13. parameter stability regions; Operations Research 53 (1); 170–176. International Journal of Operations and Production Management 10; 57-73.
problem with setup times; Operations Research Letters 32; 185-195.
International Journal of Production Economics 118(1); 282-291.
systems; IIE Transactions 25; 62-72. MATLAB Version 7.10.0.499 (R2010a). The MathWorks, Inc. Protected by U.S.
problem; International Journal of Production Economics 68 (3); 319-331. Journal of Production Research 44 (22); 4755-4771.
selection, International Journal of Production Economics 130(1); 77-86. Computers & Industrial Engineering 61(4); 920-929. Operations Research Letters 24; 65-72.
problem with backlogging; Computers & Operations Research 40; 910-919.
process for multi-period lot-sizing with supplier selection; Omega, 36(4); 509-521.
solving capacitated multi-level lot-sizing problems with backlogging; European Journal of Operational Research 214; 428-441. Journal of Operational Research 214; 223-231. Sizing; An International journal computers & mathematics 44; 263-276.
backlogging; International Journal of Production Economics 91(2); 109-119.